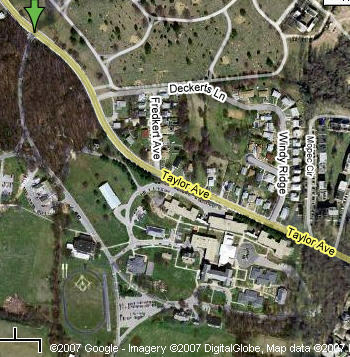 From the main entrance to MSB Campus, at the green arrow on the photograph shown on the left, follow the drive to the visitor's parking lot. Stay left at the fork in the road. The parking lot is on the right just after the oval shaped athletic area. The Jen C Russo Center for the Arts is on the left across the road from the parking lot. Newcomer Hall is the large building with pillars and CCW traffic circle in front. The main entrance to Newcomer Hall is between the pillars. Enter there to register for CSHA Language School classes. When walking to Newcomer Hall, cross to the Russo Hall side and walk along the sidewalk. You will see Morrison on the left as you go. Morrison Hall is the "house" to the left as you face Newcomer. Please do not park on the traffic circle unless you are a teacher or are handicapped. Drive north on Calvert Street to 33rd Street. Turn right onto 33rd Street. Continue on 33rd Street past Memorial Stadium to Hillen Road. Turn left onto Hillen Road. Continue north on Hillen Road, which becomes Perring Parkway. Turn right onto Taylor Avenue. Cross Harford Road and Moyer Avenue. The school entrance is the first right after Moyer Avenue. Take Kennedy Highway (route I-95) south to the Baltimore Beltway (route 695). Bear to the right onto the beltway toward Towson (Outer Loop). Take the Bel Air Road South exit (toward Overlea). At the 4th traffic light, turn right onto Taylor Avenue. The school entrance is on the left. Take route 301 to route 3, and then to route I-97 north. Once on I-97, follow the signs to the Harbor Tunnel. Take the tunnel thruway to the Baltimore Beltway (route 695). Bear to the left onto the beltway toward Towson (Outer Loop). Take the Chesapeake Bay Bridge (route 50) west. Take I-97 north toward Baltimore.